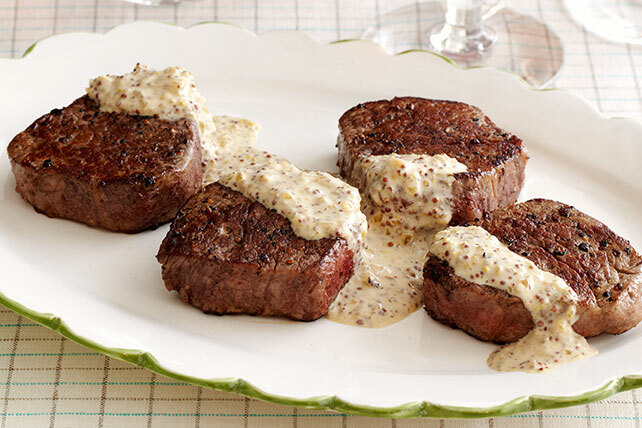 Explore this amazing filet mignon recipe with a creamy mustard-wine sauce. Our GREY POUPON Filet Mignon Recipe turns any old day into something special. Season steaks with pepper. Heat oil in large skillet on high heat. Add steaks; cook 2 to 3 min. on each side or until evenly browned on both sides. Cook 3 to 4 min. on medium heat or until steaks are medium doneness (160°F), turning occasionally. Remove steaks from skillet; cover to keep warm. Discard drippings from skillet. Add onions to skillet; cook and stir 1 min. Add sherry; cook 1 min., stirring constantly to loosen browned bits from bottom of skillet. Stir in cream and mustard; cook 5 min. or until thickened, stirring constantly. Serve steaks topped with the cream sauce. Impress your guests with this delicious, yet easy-to-make, entree. Serve with a cooked green vegetable and whole wheat dinner rolls. Prepare recipe as directed, using 24 steaks, 1-1/2 tsp. pepper, 1/4 cup oil, 1/2 cup finely chopped onions, 3/4 cup sherry, 1-1/2 cups whipping cream and 3/4 cup mustard, and cooking steaks in batches as needed. Makes 24 servings.